As locals know, the Hawaii growing season lasts all year long. If you're visiting the islands, the high quality of the locally grown fruits and vegetables will astound you, as will the vibrancy of the farmers' markets. It is well worth seeking out a market or two for a taste as well as the overall experience. You will likely see the locals lining up, waiting with great excitement to get their hands on the fresh fruits and vegetables. There is some produce that follows the typical seasonal harvest of what is at the peak in spring, summer, fall, and winter. But because of Hawaii's climate, many fruits and vegetables are available throughout the year. Here's a look at the most abundant. The Hawaiian avocado can be divided into three categories: Mexican, West Indian, and Guatemalan. There are many varieties, several of which are hybrids. Hawaii can boast that it produces some of the largest avocados in the world due to the rich soil and microclimate. Because of the many varieties, you are bound to find different avocados available at different times of the year. For example, the Sharwil, Hawaii's main export, is generally a winter fruit. Unlike on the mainland where the Cavendish is the most available type, Hawaii is home to several banana varieties, from big to small, extremely pale yellow to reddish pink. The apple banana is the most popular; it is sweeter and shorter than the Cavendish, with flavors of apples and strawberries. They can be harvested year-round but their peak season is June through October. Traditional head cabbage is not necessarily grown in Hawaii, but these islands are home to two varieties that have an Asian influence. Green mustard cabbage called kai choy, and arid white mustard cabbage, referred to as pak choy, are grown year-round. These are mainly grown in the cooler, upper regions of the state. Carrots are harvested year-round. The American carrot, Daucus pusillus, is thought to be native to Hawaii. This vegetable grows quite well in Hawaii, particularly in the windward, lower regions where there is more water. Its peak is April through August but it is harvested February through October. There are two groups of corn: temperate and tropical. Hawaii breeds supersweet varieties of tropical corn, mainly Supersweet #9 and #10. The corn is harvested four times a year and sold year-round. Cucumbers grow year-round in Hawaii in the areas that are below 3,000 feet elevation. In the higher areas, they are only grown from April to October as they become bitter during the winter months. Eggplant is a heat-loving plant, so Hawaii is a good place to grow this shiny, purple vegetable. There are four that you will most likely see in the farmers' markets: Burpee hybrid, Black Beauty, Florida Market, and Waimanalo Long. All are round except for the Waimanalo Long, which is more like a Japanese eggplant. They are available year-round. In Hawaii, fresh ginger is available from February through November, with the dried/cured roots available year-round. Freshly harvested ginger is a real treat. It is bright and tender. Do not confuse this with the ginger plant, a quintessential Hawaiian flower that comes in several beautiful varieties. These small, bright red peppers are spicy, similar to a habanero. To locals, they are known as "nioi" or "nioi pepa" and are available year-round. They are used to make "chili pepper water," a spicy condiment. Hearts of palm are the inner core of stems from certain types of palm trees that happen to grow in Hawaii. While you may be used to canned hearts of palm, in Hawaii you can enjoy this vegetable in its fresh state year round. It has a different texture and flavor than the canned variety. One of the easiest vegetables to grow in Hawaii, this winter squash is also one of the most delicious. Its hard outer shell makes it impervious to pests and tough enough to thrive in the fall and winter months when the rainfall lets up. It is available from June through March. Named after Kula, Maui, where they are grown on the upper slopes of Mount Haleakala (a dormant volcano), these sweet onions are available from early spring through early winter. They are best eaten raw but can be incorporated into cooked dishes. You may come across a few varieties of limes in Hawaii: the Tahitian lime (the most popular), the Key lime, and the Kafir lime. They are available from June through March. These big, heart-shaped leaves are from the taro plant and are available year-round. Like most greens, they can be used in a range of ways, including wrapped around pork to make laulau. This "summer fruit" peaks from May to September but is harvested year-round. Fresh lychees have a wonderful floral aroma and a bright, crunchy texture. You simply peel and eat. May through October is known as the mango season in Hawaii and can cause quite a stir. 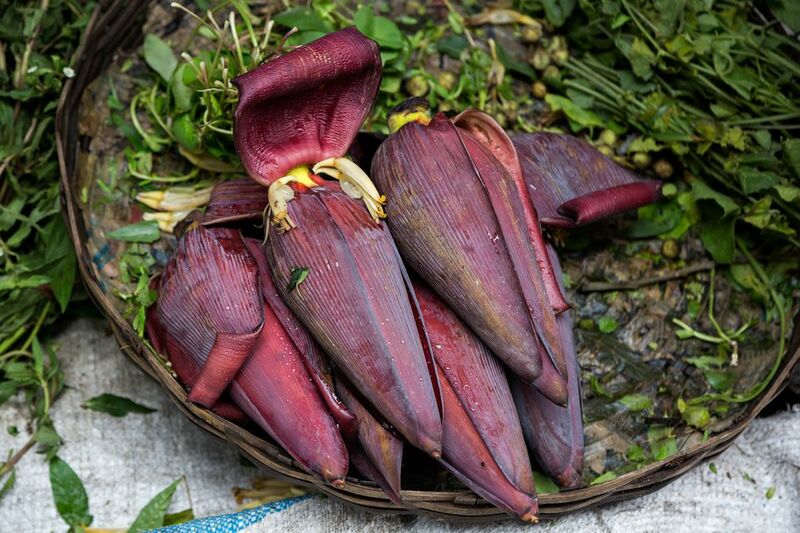 There are even festivals in honor of this tropical fruit. Local Hawaiian melons are cantaloupes, honeydews, and watermelons. You will find them in the markets during the months of May through September. These super-shiny, pear-shaped apples are plentiful in Hawaii and favored as a summer-to-fall treat. Their season runs June into October. Because of their fragile exterior, they don't usually travel too far, so you know you are getting fresh, local mountain apples. Although not technically a spinach, this edible green has its origins in Asia and has become a favorite healthy green in Hawaii. Similar to okra, the leaves can become slimy if cooked for a long period of time. Okinawan spinach is available year-round. Hawaii is home to several different varieties of oranges, including Washington Navel and Valencia Orange. This fruit is available year-round. Papayas, available year-round in Hawaii, offer more than just their fruit; the shiny black seeds at their centers are edible and tasty, too. They have a peppery flavor that's fabulous in salad dressings. A list of Hawaiian produce would not be complete without pineapples, a fruit many of us associate with the 50th state. Choose pineapples that feel heavy for their size and smell like you hope they taste. They are available year-round. Grown in the rich volcanic soil, these pretty potatoes get their purple color from anthocyanins, a natural component also found in blueberries that is very good for your health. These sweet potatoes are more dense and drier than the orange variety and therefore need a longer cooking time. They are available year-round. Year round you will find daikon and other varieties of table radishes at farmers markets, but you should also keep your eye out for the rattail radish; it may not have a pretty name, but its unusual appearance and radish flavor may sway you. Unlike the other radish varieties, the edible part is the fruit pod instead of the root. A member of the same family as lychees, this fruit is available from October through March. It has an even crazier exterior, looking like small red orbs from Mars covered with spikes. As with lychees, you just need to peel and eat them. Their taste is similar to grapes. When choosing strawberries at the market, make sure you are buying those grown in Hawaii and not California (where the majority of this berry is produced). Hawaiian-grown strawberries have an intense flavor, much more pronounced than the fruit from the mainland. The strawberries peak January through April but are harvested October through July. This tropical fruit is available from September through April. Since it is quite delicate, there is bound to be a little bruising on the skin, but do try to choose one that doesn't look too beat up. Also, skin with a bit of green is best as a starfruit that is all yellow means it is too ripe. Although the name implies this vegetable is only available in the summer months, in Hawaii you can find summer squash from June through March. Varieties to look for are zucchini, summer crookneck, white scallop, early straightneck, and cocozelle. Second, only to oranges in citrus popularity, tangerines are a fall to winter fruit available from September through February. There are a few varieties, including Clementine, Okinawa, and Ponkan, with the Dancy being the most common. This starchy root vegetable is a mainstay of the traditional Hawaiian diet and is available year-round. You may know it best as what gets turned into poi, but it can be roasted, sliced, turned into chips, and generally treated much like a potato.